Summer is coming which means I want ice cream! Haha! Recently I was told that I might not be able to partake in the dairy -part*tay at all anymore due to an allergy – so my go to ice cream substitute is always a delicious shake! This week’s is a protein shake. Now, I have done every kind of protein you can think of and I hate the after taste of protein. I swear, it doesn’t matter what brand I am using, I can always taste protein powder taste…I don’t know what it is, it is just always THERE! 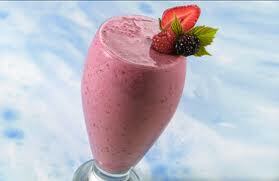 This was the first shake that I made that I did NOT taste the powder, thus making me love it even more! (and the color is pretty too!) Not only is this shake jam-packed with fruit, but it holds a great “summery” taste and keeps you full for about 2-2 1/2 hours making it that perfect morning snack between breakfast and lunch. If you try it out, leave a comment and let me know what you think! Place everything into a blender, blend, and enjoy! Previous Post What Is the Difference Between Regular and Vegan Shakeology? Next Post Could Your Vision of Success Be Holding You Back?